With AccountMate’s Manufacturing module, you can easily create work orders and explode jobs into virtually unlimited levels of raw material, labor, machine and subassembly components. You can record production lead time and monitor the inventory levels of items that you manufacture so you can effectively plan future production. You can break down large jobs into multiple start dates and steps. You can post work-in-process automatically or manually. 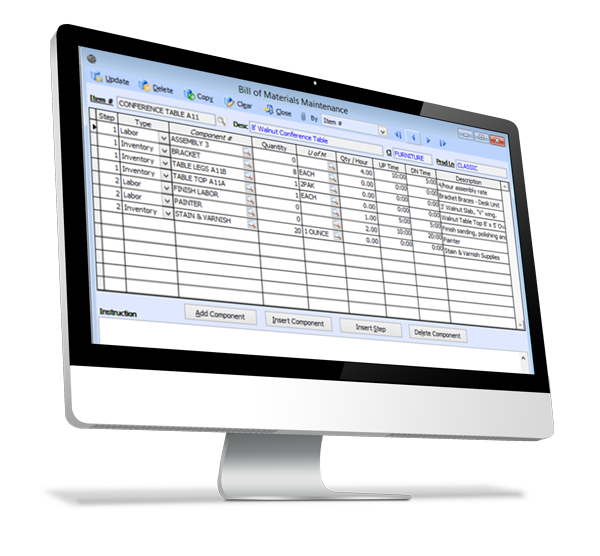 It lets you print work orders, routing slips, production slips and a wide variety of useful reports. With it, you can monitor jobs, resource usage and backorders from work order creation through the posting of finished jobs and the cancellation of any unused allocated resources.